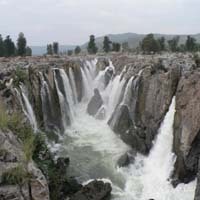 Hogenakkal Falls is one of the awesome waterfalls in Tamil Nadu on the river Kaveri. Hogenakkal is located about 750 feet above sea level. The distance from Bangalore is 132Km (via Dhenkanikottai - anchety route). Hogenakkal is a kannada word. It means smoking rocks (Hoge means smoke and kal means rock). Tamil Nadu people calls this also as "Marikottayam". Boating is the most exciting thing in Hogenakkal trip. It was allowed only during the dry-season.